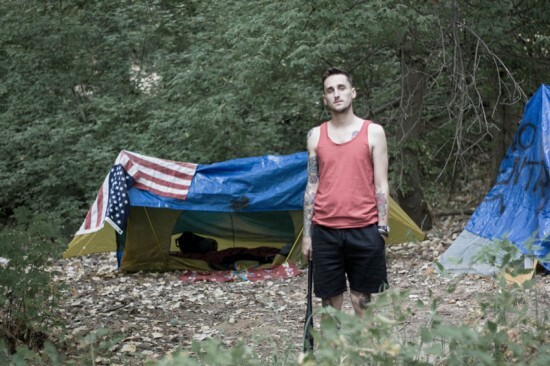 Failure of the American Dream is an exhibition featuring video and installation created in 2014 by Phil America while he lived in The Jungle, the nickname for a tent city near Silicon Valley in San Jose, California. The Jungle was the largest encampment of homeless people in the United States at the time. The exhibition explores the realities of poverty in the United States that are frequently sensationalized or ignored in Western culture while sharing the humanity of an everyday epidemic. The popularly understood ideology of "The American Dream" assumes that citizens have the opportunity to attain a level of financial and social status that will make them happy. Homelessness and the tent city are the anti-dream. People living in the tents have created housing and a community on their own terms, outside the laws of society. Their dream has been temporarily or permanently abandoned to focus on the immediate need for safety, food and shelter. Each person in The Jungle was promised this dream by their parents, their teachers, and has been denied; now their main focus is survival. Phil America will live in the installation at CAM Raleigh and share his experiences with museum visitors from May 4 through May 8.